Imphal, 11 January, 2018: Manipur Tourism announced today that the 3rd Manipur Statehood Day Women's Polo Tournament will feature women's polo teams from four continents this year. Women polo teams from Manipur representing India and other international teams from Australia, Kenya and USA will play at this league tournament in Manipur, India. The international teams are sponsored by the Ministry of Tourism, Government of India. The tournament will be held in Imphal from January 17-21, 2018. The pioneering showcase of international women's polo establishes Manipur as India's center for women's polo. 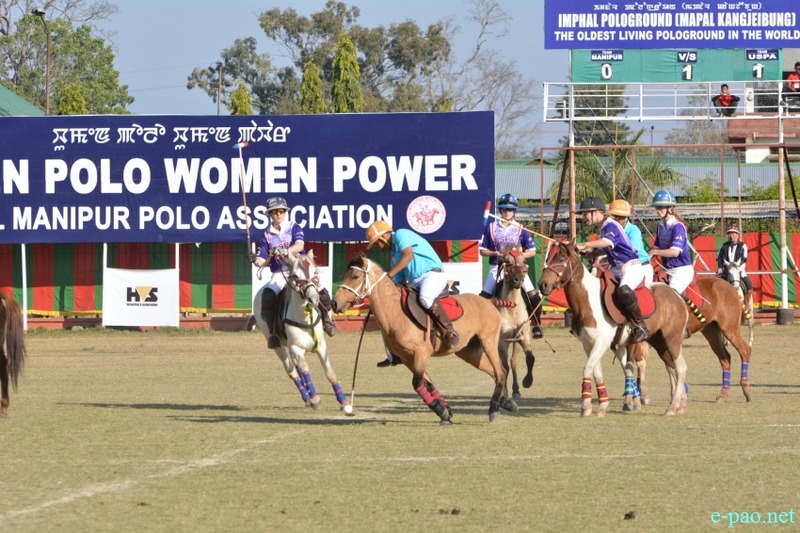 "We are looking to developing Manipur as an international destination of Polo in India, and with the help of our celebrated women, make Manipur a home for women's polo," said PK Singh, Principal Secretary (Tourism) of the Government of Manipur. Speaking about her participation at the tournament, Olivia Stringer Berube of the Maryland Polo Club, USA said, "I am terribly excited to be returning to Manipur, this time as a player. I came to watch my husband Nate play in the men's tournament during the Sangai festival, so I am really looking forward to meeting the women players". Other players in the American team include Belinda Brody from Vero Beach Polo Club in Vero Beach Beach, Florida; Eva Crossman, Captain of the Varsity Polo Team at the University of Kentucky in Lexington; and Marissa Wells from the Texas A&M university polo team in College Station, Texas. The participation of international polo players is intended to support, develop, and promote women's polo in Manipur and the rest of the country. "We have been helping develop this tournament for Manipur since 2016. But if it were not for the Manipuri women players, we would not have been inspired to help build this tournament to support and encourage them as well as other women players in India," said Ed Armstrong, adviser-partner of Huntre! Equine and Secretary and Treasurer of the American International Polo Federation, who put together the US team. "I am so thrilled to be bringing a Kenyan Polo Association ladies team back to beautiful Manipur. What better place to promote ladies polo than where modern polo began! I fell in love with the Manipuri pony which is such a willing steed with a huge heart”, said Rowena Stichbury Vice Captain of Nairobi Polo Club. The Kenyan team is led by Tiva Gross, and also includes Nikki Barlow, Imogen Voorspuy, and Kaila Millar. Leading the pack from Down Under, Billie Mascart from the Windsor Polo Club in Sydney said, "We hope to do as well as the Australian men who won the men's tournament here in 2916. We have put together an amazing team here with the help of the Australian Polo Federation. Indiana Bennetto, Alessia Russo, and the Warren sisters, Whitney and Chloe, from Adelaide join me in saying Khurumjari Manipur!" The 3rd Manipur Statehood Day Women's Polo Tournament is part of Manipur Tourism’s campaign to save the unique and endangered Manipuri pony and also to promote Polo tourism in the Manipur- the Birthplace of Modern Polo. Manipur Tourism also organises the Manipur Polo International Tournament (Men’s) as part of the Manipur Sangai Festival every year from November 21-30. These tournaments encourage exclusive use of the indigenous Manipuri pony only and are played at the oldest living polo ground at Imphal at Mapal Kangjeibung. Manipur Tourism’s Manipur Statehood Day Women's Polo Tournament - is a production of Polo Yatra, the women's polo initiative of Huntre! Equine. The tournament is organized by the All Manipur Polo Association. Incredible India! has provided the international travel support for this event.